Kamiyama can be accessed from Tokushima JR Station via local bus (approx 60 min). The same journey takes about 40 minutes by car. Unfortunately, there is no train line running to Kamiyama. The closest airport to Kamiyama is Tokushima Airport. There are flights from Tokyo (6 x daily – JAL), Nagoya (2 x daily – ANA), Fukuoka (2 x daily – JAL), and Sapporo (seasonal – JAL). There is a 30 min shuttle bus from Tokushima Airport to Tokushima JR Station. If you arrive in Japan via Narita Airport in Tokyo, take a shuttle bus from Narita to Haneda Airport, and fly to Tokushima from there. If you arrive in Japan via Kansai Airport, or from another part of Japan to Kobe Airport or Osaka’s Itami Airport, you can catch a highway bus from there to Tokushima City. 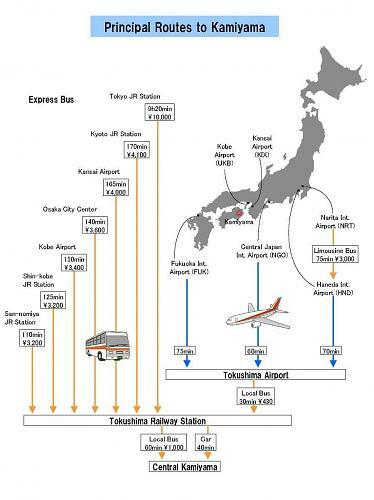 There are direct buses from Kansai and Kobe Airports. 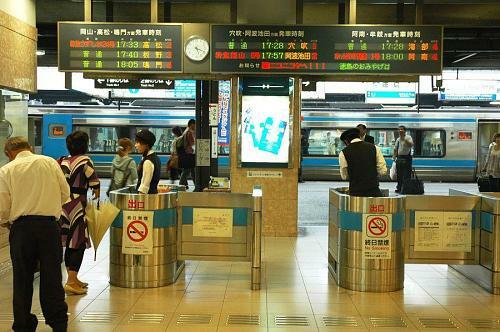 From Itami, you will have to change buses at Osaka Umeda station or Kobe Sannomiya station. The most convenient and affordable way to get to Tokushima from Kansai is via highway bus. There are several runs daily from Kyoto, Osaka, and Kobe. There is daily service from Takamatsu, Kochi, Matsuyama, Kurashiki, Okayama, and Hiroshima as well. Overnight buses leave Tokyo and Nagoya nightly. The final stop for all these buses is Tokushima JR station. If you have a Japan Rail pass and you’d like to make use of train lines as much as possible, you can access Tokushima via Okayama station. Take a train from Okayama station to Takamatsu station (via the Seto Ohashi bridge – 65 min) then transfer to a train bound for Tokushima (60 min). If you are coming via Shinkansen from Nagoya or Tokyo, it is faster to get off at Shin-kobe station and take a bus to Tokushima station from there than it is to take the train around. If you have any questions about other modes of transportation, please contact us.